Two big political parties alliance in Maharashtra came to an end. It came into public the duo had a meeting with B.J.P president Amit Shah which didn’t go well and then this news came out. It was a big political news for Maharashtra as these both party were in alliance for last 25yrs which broke down in less than 25min on 25th September’2014. 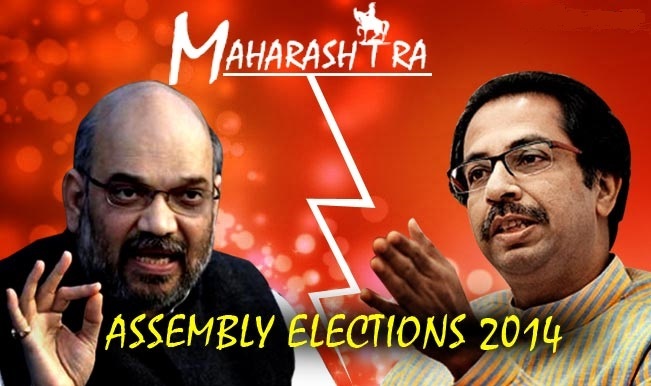 People of Maharashtra were expecting more from B.J.P and Shiv Sena’s alliance but as they broke out now it is challenging to vote and it will be difficult to predict which party will make its government in Maharashtra. The seat sharing has led down the breakup of both the parties. B.J.P have started their campaign with Narendra Modi in Maharashtra with overall 24 rallies and first started off with Mumbai at racecourse. B.J.P are not directly criticizing Shiv Sena for alliance but Shiv Sena are directly blaming the B.J.P. Shiv Sena supremo Uddhav Thackeray told us that if Rajnathsingh would be the B.J.P’s president then this alliance would not have been broken. He talked to many big leader of B.J.P but nothing worked out. Now all the parties will play independently in this politics game and will target each other and will divide the votes as in of Muslims, dalits, Marathas, Guajarati, Hindu and Marwari. These communities are diversified in different location and not one region so the election of Maharashtra is going to be a huge rock and roll for all the party. 15th October’ 2014 is the date of Election in Maharashtra and Haryana for their assembly election. 19th October’2014 the results will be declared. B.J.P has set its candidates for 257 seats out of 288 seats and remaining 31 seats have been given to 5 other parties which have alliance with them. Shiv Sena are contesting for 286 seats out of 288 seats. The 2 seats are been left out for Munde’s sister. MNS an emerging party in Maharashtra will also contest in this election and they have to work hard to survive in this election. Raj Thackeray announced 239 candidates for 288 seats. What do you think who will make the government in Maharashtra? Comment below your views. Go for Vote as it is our Rights and no one can take it from us. You are only the one because of whom the new government will get elected and which will help to develop and empower your state. So it’s our request from our whole team to go for Vote and elect the best and good governance.